A couple months back I shared this post over at Put a Bird On It. It’s a great gift idea and easy enough to do in time for Father’s Day this weekend. Earlier this year Little Lady and I were searching for the perfect gift for Daddy. She had 2 things in mind 1) he likes coffee and 2) he likes gum balls. Her original thought was to go to the mall and buy him a cup of coffee along with some gourmet gum balls from the candy store. 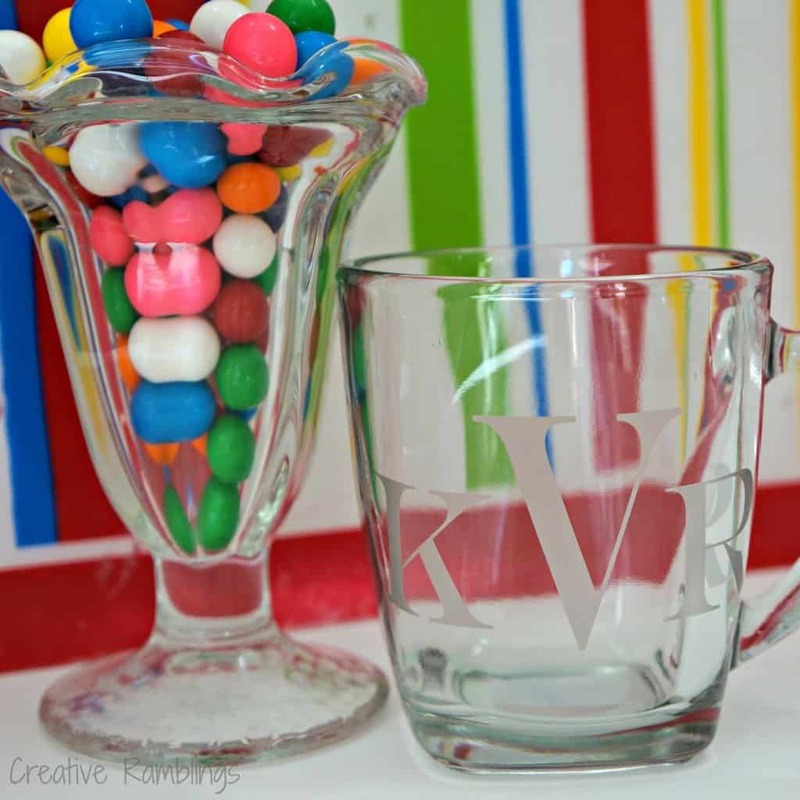 Before we made that trip she spotted a bag of gum balls at Target and we happened upon a clear glass mug on clearance. 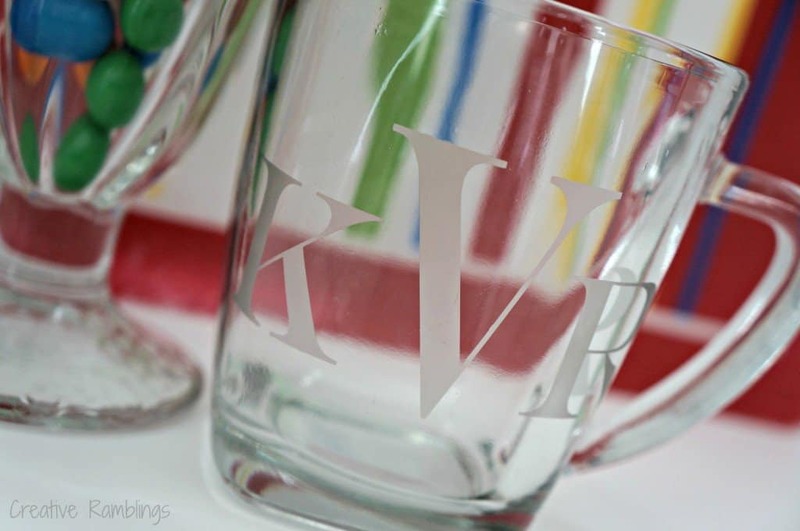 We decided on an Etched Glass Mug Perfect gift for Daddy! To dress the gift up a bit I decided to etch Daddy’s initials into the mug using my Silhouette. Not really a project a 3-year-old can help with, but she did help in picking out the font and of course filling the mug with gum balls. When I bought my Silhouette last year the glass etching kit was included! It wasn’t something I needed, but I have used it several times and love it. The videos and instructions from Silhouette America are really simple and easy to follow, I tend to do exactly what they say and my projects seem to come out nicely. 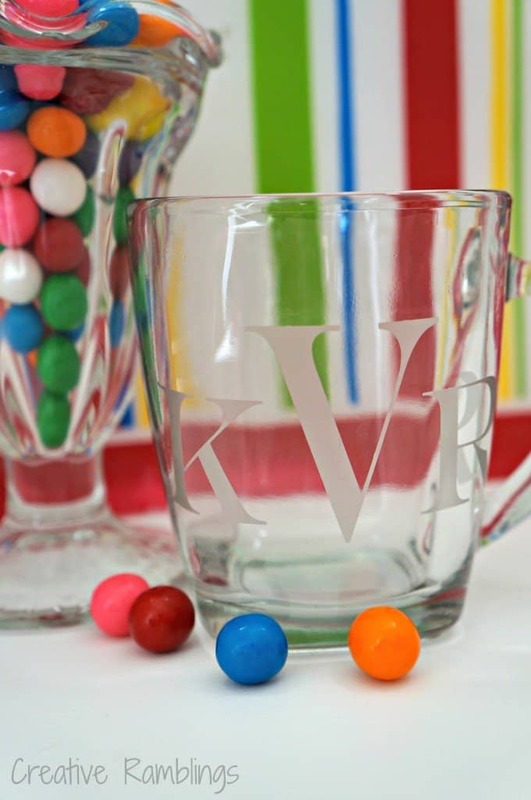 Little Lady and I chose a nice font, followed the steps to etch it into the mug, and filled the mug with gum balls. A couple tips from my etching experience. Start with clean glass, free of any grease and residue. Take your time adhering the stencil to the glass. Apply slowly and use the scrapper tool or a credit card to smooth out all the bubbles. The etching cream works quickly, once it’s on the glass it will etch. Be careful to only put it where you want it. To help with this point, add a thick border around your stencil so the cream does not spill over. Daddy loved his gift! She was so proud to give him something she picked out and worked so hard on. The gum balls are long gone but he uses his mug every day! Have you ever etched glass? Tell me about your favorite project. It’s one of my favorite craft techniques. Thanks Bernadyn, and thanks for the follow! Have fun etching. Great glass etching project and tips! I love glass etching too and use it often! It’s so elegant and works wonders for personalized gifts! I have a similar project posting on my blog soon for my most recent glass etching project, I’m pretty excited about it! Thanks for linking up with Creative Spark Link Party… YOU ARE THIS WEEK’S MOST CLICKED AND WILL BE FEATURED… YIPPEE! Hope to see you again Wednesday! I know it’s been so fun! I linked up this morning, always a great party.